Have you ever come across a tablet? If yes, you might be in a position to guess what a Nook is. If not, don’t feel out of place for learning is an experience. A tablet is a device not as large as a computer and not as small as a phone; it can be said to fall in between a phone and a computer. Allow me to pose another question which will shed more light on our discussion; I hope it won’t drive you into more confusion, and if it does worry less for learning is still a process and an experience. Have you come across an e-reader? If yes, you might be making more right conclusions about a Nook. If you ended up having ‘no’ as your answer for the two questions posted above, here is your opportunity to learn something new, keep flowing with me. A Nook is an electronic device that can serve both as a tablet and an e-reader. Since we can already define a tablet as an electronic device falling in between a phone and a computer, let us define an e-reader. E-reader stands for the electronic reader; in the current digital age, books, magazines, and even periodicals are fast being presented on screens of our different devices unlike in print form. An electronic reader is, therefore, a device used to display and read digital content; this might inform of textbooks, magazines, novels, and any other form of publications that you can think of. Barnes & Noble Inc launched the Nook Tablet. The main reason why it was started was to act as a digital library for e-Books supported on the device. Having earlier mentioned that print books are getting digital should hint you that libraries are equally going digital! What does this mean?! This just means that if I get to buy a lot of electronic books from an e-book retailer, I can be in a position to manage them in the electronic library. 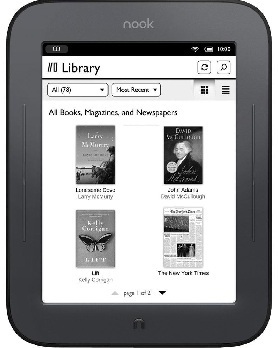 A Nook tablet is an electronic library. Today, the Nook tablet is more than just an e-reader or digital library for e-books by Barnes & Noble Inc. This is as a result of growing competition from other books retailers such as the iBookstore. The Nook tablet does not just serve as an e-reader for thousands of books offered by Barnes & Noble Inc. With the device, the owners can get to access their emails, watch a movie or listen to music, and play a game or two. The Nook has an Android operating system, with an internal storage of up to 8GB or 16GB all depending on the version of the device one has at hand. This is good news for users as they can get to store voluminous stuff under one roof. It should be however noted that a greater percentage of the internal storage is preserved for content from Barnes & Noble Inc. store. For instance, an 8GB Nook Tablet has 5.5GB of the total 8GB reserved for content from Barnes & Noble Inc. store. Talking about Wi-Fi, the device is Wi-Fi enabled giving readers an opportunity to download content over free available Wi-Fi at coffee shops, malls, and even Nook store. Brought out to the market by Barnes & Noble in late 2011, this was one of the primary devices to come out of the stable. The Simple Touch is a Wi-Fi-only Nook, with an infrared touch-screen, E Ink technology, and battery life of up to two months (or 150 hours, offering approximately 25,000 continuous page turns with Wi-Fi turned off). The device weighs 212 grams (7.5 oz) with dimensions of 6.5″ × 5″ × 0.47″. Barnes & Noble brought this out on November 19, 2010, and the initial price set was at US$249. The Nook Color comes with Android 2.1 pre-installation. The device is powered by a TI OMAP 3621 800 MHz processor and has 512 MB of RAM, 8 GB of flash storage, a 7″ LCD screen, and a microSD expansion slot. On February 21, 2012, the price of the Nook Color was reduced to US$169. During August 2012, the price of the Nook Color was reduced to US$149. During November 3, 2012, following the release of the Nook HD and Nook HD+, the price of the Nook Color was reduced to US$139. The 7-inch Nook Tablet, based on Android OS, with 16 GB of internal storage became available on November 17, 2011, for US$249. A version with 8 GB of internal storage was made available February 21, 2012, for US$199, replacing the Nook Color in that price range. On August 12, 2012, the price of the Nook Tablet 8 GB and Nook Tablet 16 GB were reduced to US$179 and US$199 respectively. Nook HD (styled NOOK HD), announced September 26, 2012, and released November 1, 2012, along with the Nook HD+, is a 7-inch tablet with a resolution of 1440×900. It competes with the 7-inch Kindle Fire HD and comes in two colors: snow and smoke (a dark gray). Nook has a Texas Instruments 1.3 GHz dual-core processor with 1 GB RAM. It can play back video at 720p from the NOOK Video store, much like Amazon.com’s Instant Video service. The Nook HD was initially priced at US$199 for 8 GB and US$229 for 16 GB. It then sold at reduced prices at US$129 for 8 GB and US$149 for 16 GB. On the other hand, Nook HD+ (styled NOOK HD+) is Barnes & Noble’s first tablet capable of playing back movies, and television shows downloadable from NOOK Video store at 1080p resolution. 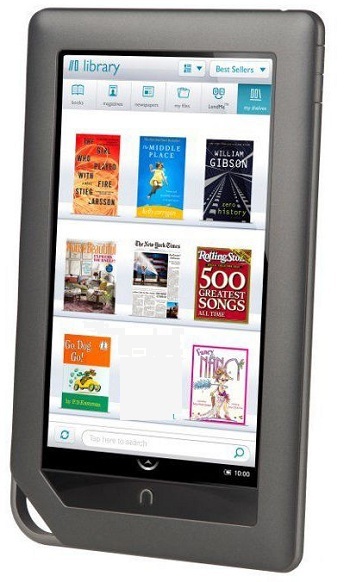 Announced on September 26, 2012, the NOOK HD+ is a 9-inch tablet with a 1920 × 1280 resolution. It competes with the similar 8.9-inch Kindle Fire HD and has a Texas Instruments 1.5 GHz dual-core OMAP 4470 processor and was initially priced at US$269 and US$299 for 16 and 32 GB, respectively. Then only the 32 GB model was available at US$179. 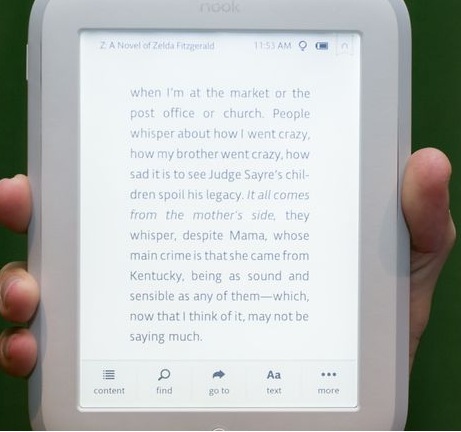 The Nook Glowlight (marketed as the “Nook GlowLight”) e-reader was released on October 30, 2013. The Glowlight uses a 6-inch touch screen with E Ink Pearl, Wi-Fi and has a battery life of two months with wireless off; it launched at a US$119 retail price. It weighs 175 grams (6.2 oz) with dimensions of 6.5″ × 5″ × 0.42″ and has 4 GB of storage, of which 2 GB is reserved for Nook Store content and 512 MB for additional user content. The device uses Android 2.3, and it has an 800 MHz processor with 256 MB of RAM. Compared to the Nook Simple Touch Reader, the GlowLight has a white exterior, a brighter screen, a boost in screen resolution to 1024 × 758 and a more durable silicone edge. Compared to the Simple Touch, the microSD card slot, and page-turn buttons have been removed. On November 21, 2014, the Glowlight’s price dropped to US$99. Nook being a robust device in itself extends some great reading experience for an avid reader. You can get this experience on PC systems as well, by downloading a standalone application for Nook that is free on their website. If you’ve got a laptop or a netbook, you’ve already got an excellent eBook reading device. The Barnes and Noble Nook for PC let you read your Nook eBooks, eNewspapers, and more on any of your computers. It’s available for both Mac and PC, but here we’ll look at the Windows version. Visit the Nook website for 32 bit or 64-bit versions of the software. Save the file and run the program. On the first run, you’ll need to enter your Barnes & Noble account information, or if you don’t already have an account, click Create An Account at the bottom. Once you have got in, you can automatically see the previously purchased books appearing on the bookshelf. If you are in search of eBook publishing services provider, you don’t have to go so far for we are the leading publishers in the industry; offering quality publishing services at an affordable cost. We can also provide guidance and advice on the type of device suitable for your digital content, Nook being one of them. Kindly make a point of reaching out to us at our offices or via our contacts.